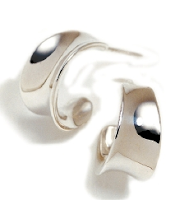 Silver jewelry puts delightful pieces on our hands or ears at a fraction of the price of more precious metals. But because so many lacklustre pieces are made of silver– market stall junk that's cheaply fabricated or set with dull, badly-cut stones– it doesn't always get its due admiration. Pure silver is soft, so metal alloys (usually copper, sometimes nickel or zinc and rarely, platinum) are added to harden it. 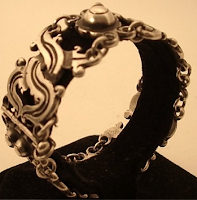 Silver jewelry must contain at least 92.5% silver to be considered real, or sterling, silver. 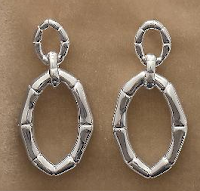 Some jewelry is 95% silver, stamped 950. Exceptional silver pieces have weight and fine workmanship that rival the best goldsmith's. Here are a few of my bracelets and rings made entirely of silver. 1. Georg Je nsen Biomorphic bracelet, designed by Henning Koppel, circa 1960. An iconic pi ece purchased on eBay about 12 years ago. I've also shot it held open so you can see the array of links, each different. 2. 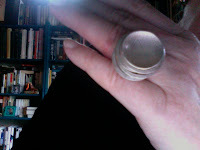 Sans-Titre silver ring, by Violaine Ulmer, bought in Paris ca. 2007. Five concentric stacked rings slide freely under the concave-disc top. 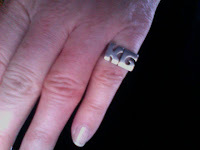 A local silversmith told me this is a demanding ring to make. The face has a finely-etched irregular grid pattern. 3. Art deco bee bracelet by Toronto jeweler Susan Cockburn, who now lives in Dubai; bought around 15 years ago. The clasp cleverly hides under one bee so it looks seamless. 4. 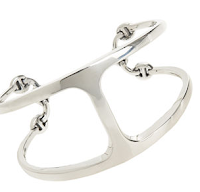 Corset ring by Vancouver's Anat Basanta. The chased work of a vaguely Persian-style pattern seems to harmonize with whatever I wear. 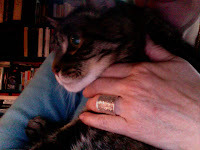 You can't quite see the delicate tracery of vines and leaves– our shy, senior tabby was unwilling to pose any longer. 5. One of the first pieces of jewelry I ever bought. I might have been twelve when an ad in a catalog for a silver ring made of your initials incited my first case of jewelry lust. Think it was $35, which represented a lot of babysitting. Once, this ring fit my ring finger, now it fits the pinky. Forgot about it for forty years and found it in my mother's jewelry box when disbursing her estate. William Spratling Silver Bracelet, ca. 1940. Stunning example of the famous designer's art. $1,850 from Go Antiques. Bamboo Drop Earrings, 1 3/8” long x 5/8” wide, from Gump's, $150. Salsa earrings, below, £35 (including VAT) from Braybrook & Britten. 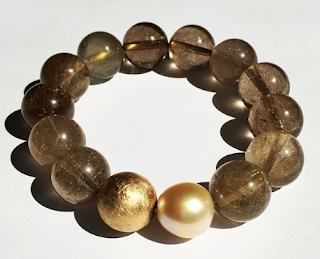 Hoorsenbuhs Phantom bracelet, 1 1/2" wide, $1,550 from Barneys. Scots Pine Bracelet by Malcolm Appleby, £625 from Thistle and Broom. 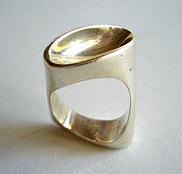 Vintage Diagonal Oval Silver Ring, ca. 1960s, by Torun for Georg Jensen, size 7, $350 from 20th Obsession. For any occasion, a piece of vintage silver jewelry is a marvelous gift idea. Those are fabulous pieces, Duchesse! I love the fluidity of the designs. Beautiful silver, the Georg Jensen stands out. I imagine this would compliment any outfit. 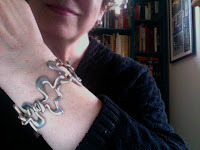 I have a bunch of stackable sterling silver bangles and wear them all at once. They are versatile and go from jeans to the LBD. Ooohh, silver! I wear mine just about every day. Yes, a lot is Native American, but there's a lot of non-native too. I love that you found your initial ring! Lovely, inspiring, and instructive post, as we've come to expect from any of your jewelry posts -- thanks! I'm like Nancy and wear silver almost daily, especially my talismanic First Nations (Nat. Am.) bracelet. I'm beginning to suspect (I'm such a slow/late learner) that gold might work better for me, but will probably stick with the less expensive metal for this lifetime. Ooooh, I love the Georg Jensen, and the bee bracelet. The bamboo earrings are lovely too. 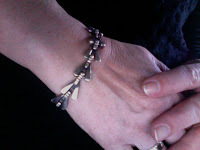 I do love silver bracelets - I have quite a few. 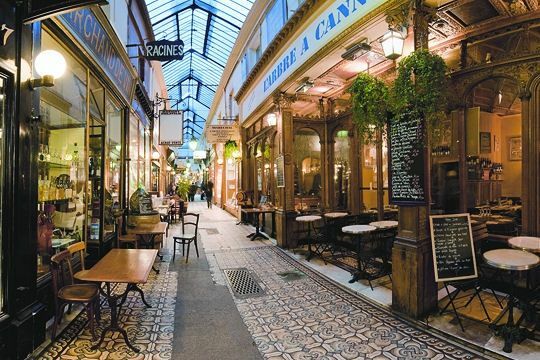 As you say, it is relatively cheap so you can indulge yourself without guilt! metscan: Silver is nearly always more informal but I like it on all ages. Beautifully made silver pieces are not inconsequential purchases, at least for me. hostess: Always wanted to collect a stack of bangles! Nancy: I would go crazy buying what is available to you in Santa Fe. Have a few turquoise pieces I bought about 40 years ago. materfamilias: I find silver very versatile and would not give it short shrift. LPC: For several years had a nasty allergy to gold! Wore only silver from 20 to maybe 28- but gradually became able to tolerate gold again. My father was allergic to all metals, wonder if I inherited my sensitivity? Now all metals are fine. You have some lovely pieces - love that first bracelet. 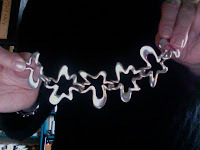 I love silver (works with my colour too), you can get great pieces for a reasonable cost. Duchesse: I don´t think that silver jewelry is inconsequential by any means. I have seen great silver art in my life time. The silver jewelry I have departed from was quite simple, I had received it as gifts when I myself was young, and I still strongly believe that silver should be the first jewelry for a young girl. Neither do I think that designer bags of exotic skins feel ok, carried by the very young. In my opinion, this much more expensive stuff should be saved for our later years, women of a certain age. Individuals usually are wonderful bits, Duchesse! I love the fluidity of the designs. Hello - I have a ring made by Susan Cockburn, she named it 'Wave' ring it is silver and gold. I bought it in 2000 in Toronto. 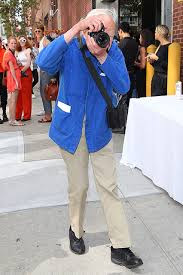 Do you know her contact info now? I just love this unique piece - would love to see what she is doing now. Hope: I have an e-mail address for Susan but am not sure it is current (she moves about the world these days, last place I knew of was Dubai.) If you would like it, please contact me c/o e-mail (you can find it my Profile under "Contact Me") and I will reply. For men, a tightly knit link bracelet that resembles chainmail is popular with many men, thanks to the resurgence of Roman culture in our movies and fictional diversions. Find your favorite new bracelet now.